Lock in a great price for Hoposa Uyal – rated 8.7 by recent guests! Rooms are very comfortable and the beds very nice. 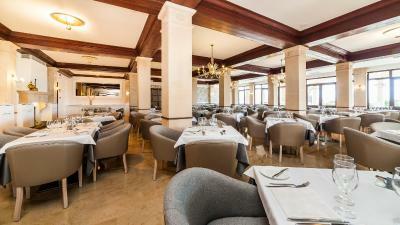 The staff were all great and the restaurant team all very hard working and friendly. Breakfast buffet had a nice variety and the Omlette Chef was a character. Beach towels are provided for free. Air conditioning was Rock solid in our room. 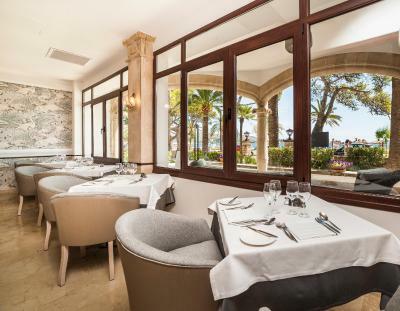 Huge terrace overlooking the sea, pool and promenade in room 262. 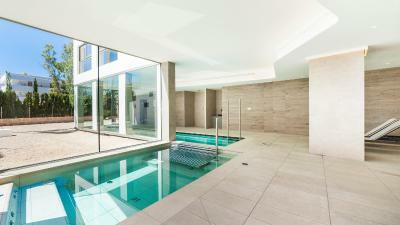 Nice gym and spa area. WiFi was the best I've had in a hotel in a long time. Ran a speed test and received a 60mbps download speed. We were able to stream video nicely over Hulu. Free parking behind the hotel annex next door is provided at no cost. There is a nice little bar right on the beach across the street that has occasional live music in the evening. Several Spar markets within two blocks of the hotel. My wife had a cold when we arrived and there was a pharmacia a few blocks up the street who assisted us with cold remedies. Overall a great Hotel. I would return here without question. The whole experience was very pleasurable, we got half board, and both breakfast and dinner had good variety and quality meals. Room was spacious and the bathroom was excellent and modern. The building was impressive and looked better than in the photos. The room had everything for a comfortable stay including tv with many channels in various languages. I am American but I really enjoyed the many British channels. We were able to enjoy many good movies at night when unwinding from long days out and about and at the beach. The lobby and fun, nightly entertainment was great. Located on a lovely, very calm beach; great for families. Very short, pleasant walk along the beach to town with more cafes and restaurants. We explored a few other places on the island because we had a car and this was a nice, calm home base. Just very pleasant, clean and safe place. Loved it. the beach front was bigger and less congested than other areas. and there were umbrellas and day beds for rent. this made it very comfortable and convenient. there was also a convenience store nearby to buy drinks and snacks. Second time i have stayed - great hotel/brand -and half board option great value. 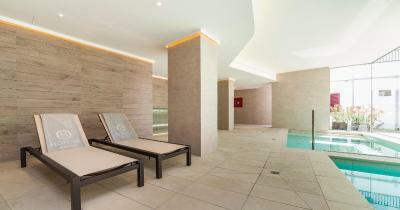 Spa, breakfast (quality and range of choice both very good), helpful staff, good shower. 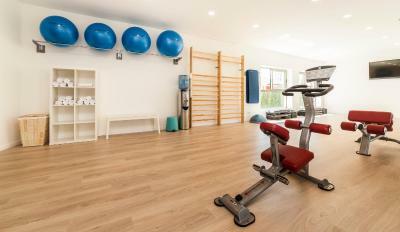 Hoposa Uyal This rating is a reflection of how the property compares to the industry standard when it comes to price, facilities and services available. It's based on a self-evaluation by the property. Use this rating to help choose your stay! 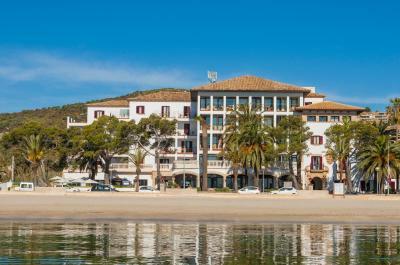 One of our top picks in Port de Pollensa.The Majorcan-style Hotel Uyal is set on the seafront in Port de Pollença, overlooking Pollença Beach. It features an outdoor pool and modern rooms with free Wi-Fi, flat-screen TVs and views of the mountains or sea. The characteristic whitewashed Hoposa Uyal lies by the sea, in the shadow of the Tramuntana Mountains. 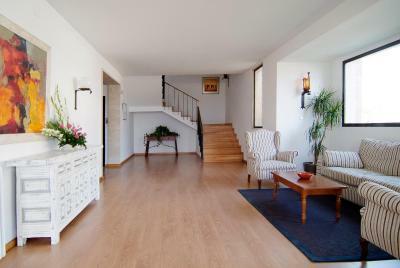 It is 0.6 mi outside the center of the charming resort of Port de Pollença. Make the most of the sunshine with a swim in Uyal Hotel’s outdoor swimming pool, or by simply lying back on the terrace’s sun loungers. You can explore the wonderful natural surroundings using a bicycle hired from the hotel. 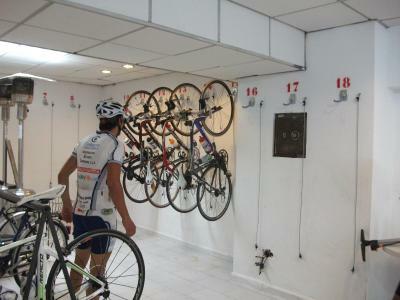 There is an on-site bicycle garage with space for 70 bikes, and there is also a bicycle-washing area where you can find tools. Mechanical services are available on request. You can also spend the day at the local golf course, 6.2 mi away. Hotel staff can help you arrange green fees. When would you like to stay at Hoposa Uyal? Featuring partial sea views, this room includes free Wi-Fi, a flat-screen TV and a free safe. Overlooking the Tramontana Mountains and Mount Putxet, this room features free Wi-Fi, a flat-screen TV and a free safe. This room features free Wi-Fi, a flat-screen TV and a free safe. Overlooking the sea, this room features free Wi-Fi, a flat-screen TV and a free safe. Most of these rooms also have a balcony. 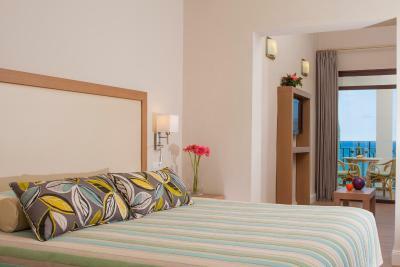 Featuring a balcony or terrace with sea views, this suite includes a king size bed and a lounge area with 2 sofa beds. 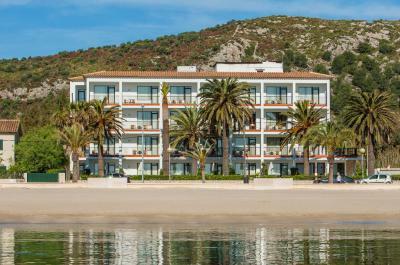 This emblematic Puerto Pollensa luxury hotel dates from 1954 and is a fine example of the typical architectural style to be found on the island of Mallorca in Spain. 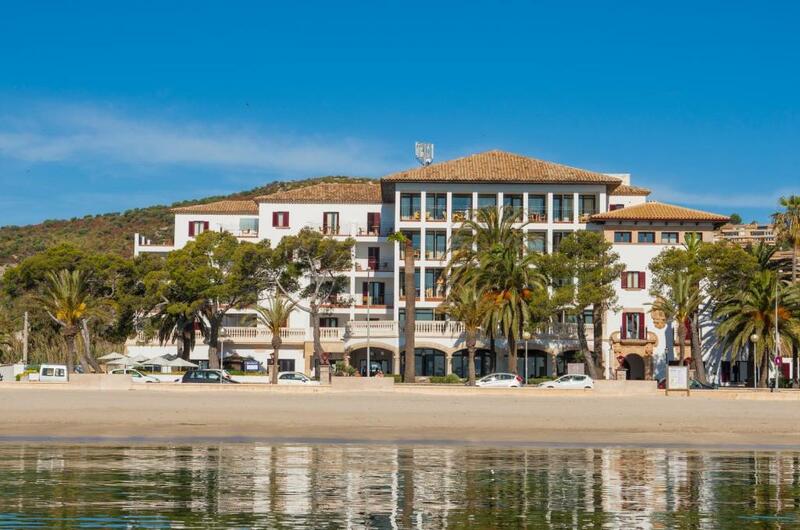 It consists of two buildings, beautifully decorated and in an outstanding location on the beachfront in the Bay of Puerto Pollensa. 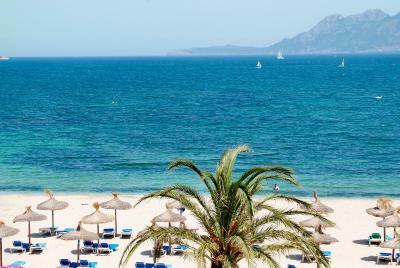 Just 10 m from the sandy beach which is located right in front of the luxury hotel. There is a wide range of cultural, leisure and nature activities available just a few kilometers away from the resort. House Rules Hoposa Uyal takes special requests – add in the next step! Hoposa Uyal accepts these cards and reserves the right to temporarily hold an amount prior to arrival. Please note that gentlemen must wear long trousers in the restaurant. Lovely hotel with helpful staff in a pretty seafront location. Good breakfasts. BAR SERVICE COULD HAVE BEEN A LITTLE BETTER BY HAVING SOMEONE IN ATTENDANCE AND NOT HIDDEN AWAY ON OTHER DUTIES IN THE KITCHENS .NEVERTHELESS, THE BAR STAFF WHERE VERY NICE . BEHAVIOUR OF MALE TABLE CLEARING STAFF NOTED ABOVE. IT PUT ME OFF THE SELF SERVICE SYSTEM ! THE FOOD WAS GOOD .HOWEVER THE SELF SERVICE WAS NOT VERY SUCCESFUL. EVERY TIME I GOT UP TO GET SOMETHING MY PLACE WAS CLEARED BY OVER ZEALOUS STAFF. OTHER HOTELS HAVE OVERCOME THIS PROBLEM BY WAITERS SERVING COFFEE AND TEA . THEY THEN KNOW WHO IS STILL EATING AND WHO HAS FINISHED, AND THEREFORE WHICH PLACE MATS /TABLES CAN BE CLEARED. Hotel is great friendly staff excellent location and very good facilities!!! Great hotel. Great food. Lovely rooms and attentive staff. Room smelt a bit of chemicals and the air-conditioning only pumped out hot air. The internet in the annex was quite slow. Also thought it was a shame that the pool didn't open until 10am. View from the sea view room was lovely! Breakfast was very nice. Beds were comfy and the shower and the shampoos etc were good. Seating area out the front of the hotel was useful too. 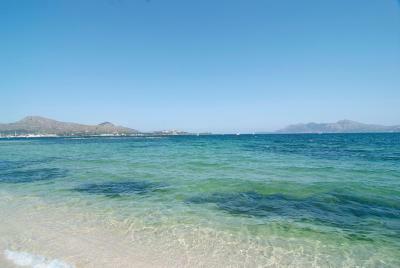 Location was ideal -away from the busy area of Puerto Pollenca yet within walking distance of all the facilities. The hotel was spotlessly clean and staff were very friendly and helpful. Lovely breakfast and comfortable bed. As hotel wasn't busy an offer of an upgrade to a sea view would have been appreciated and made an impression. The outlook of our room wasn't great, but next time I would book a sea view. This is a great place to stay. The staff were working hard to keep the hotel clean and attractive. It’s a 15 minute walk into the town along the front. That makes it easy to park and quiet at night. Great facilities for cycling. My room was a little bit small. Water in the room is expensive. Great location right by the beach. Reception open 24/7 and friendly service. Good breakfast in nice atmosphere.